If you're looking for a way to truly make the world a better place by writing a check, look no further than The Rotary Foundation. 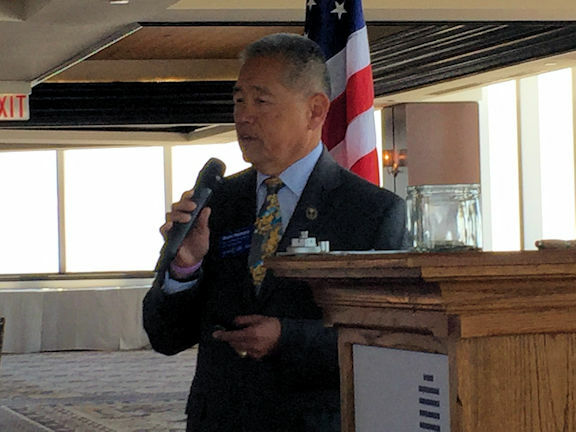 Such was the message delivered to members and guests of Ventura Rotary South at our meeting on Monday, May 7, by Past District Governor Wade Nomura. "The Rotary Foundation is one of the world's most respected charities," said Wade. He noted that this is one of the reasons that the Gates Foundation partnered with the Foundation in its fight to eliminate polio worldwide. The Rotary Foundation, as the charitable arm of Rotary International, is charged with supporting Rotary's six areas of focus: promoting peace; fighting disease; providing clean water, sanitation, and hygiene; saving mothers and children, supporting education; and growing local economies. Wade's presentation included photos and stories of some of the dozens of trips he has made on behalf of Rotary to cities and villages around the world. Wade is involved with the Rotary Foundation Cadre, a group of volunteer technical advisors who evaluate global grant projects in each of Rotary's areas of focus. Wade's specialty is water, sanitation, and hygiene. Wade noted that there are many different ways to support the Rotary Foundation, from individual donations to the General Fund or specific areas of focus, to arranging for Rotary to be part of an individual's estate plan. He also reviewed the various levels of donor recognition offered by Rotary. Click on this link for more information on the Rotary Foundation. Even a small donation can make a significant difference in the lives of people in need!